Join the battle between angels and demons on Archangels Slot at Wicked Jackpots. This creation of NetEnt comes with 6 reels and 100 paylines. It is based on an innovative theme involving angels and demons in an apocalyptic battle. Enjoy this slot at Wicked Jackpots using a PC or mobile device. 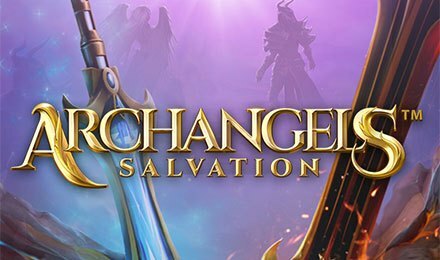 Be amazed with the original graphics on Archangels Slot! Its background shows a heavenly landscape on one side and on the other side, you can see the raging fires of hell. During the game, you are accompanied by an angel and a demon wielding a weapon. Find symbols like Diamond, Heart, Spade, Club, Angel, Demon, Skull, Lion, Hood and Helmet on the reels. It is quite simple to play Archangels Slot! Simply form combinations of similar symbols to trigger a win. Select your preferred coin value on the Coin Value field. On the Level field, adjust your bet levels. Place the highest bet in just one click with the Max Bet button. Next, initiate the reels by pressing the Spin button. Click on Auto Play if you wish to enjoy several games played automatically. Bet Levels: Select from 1 to 10 bet levels. Amount of Paylines Selection: Choose up to 100 paylines. Coin Values: The coin denominators range from 0.01 to 200.00. Wild on Archangels Slot substitutes for all symbols, except Scatter. It can also land fully or partially in 2x2 stacks in Hot Spot areas. Two Hot Spot areas are available on this slot. The first Hot Spot area consists of the top 2 rows and the second one consists of the 2 bottom rows. Scatter symbols help activate the Free Spins Feature. When 3, 4, 5 and 6 scatters land anywhere, 10, 15, 20 and 25 free spins are awarded, respectively. The free spins however cannot be retriggered. The Heaven Feature corresponds to the top Hot Spot area. It is triggered when 2x2 wilds appear fully or partially on the top Hot Spot area. When they land partially, 2 stacks of wild symbols are triggered and added to the reels. When they appear fully, 4 stacks of wilds are triggered. The stacks may contain 3 to 5 symbols. When 2x2 wilds land fully or partially at the bottom Hot Spot area, the Hell Feature is activated. The Hell area shoots single wilds at random on the reels. When 2x2 wilds appear partially, you can receive 8 single wild symbols. Earn 16 single wild symbols if the 2x2 wilds fully appear. Both Heaven and Hell features can be retriggered when stacks of wilds or single wilds land in the respective Hot Spot areas.